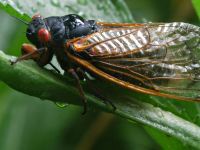 May 2004, the invasion of the seventeen year periodical cicadas begins. After weeks of waiting, I finally see signs of them. Over the next few days, they come out in force. Every morning, around 8am, they are crawling up the trees and coming out of their shell. The sixteenth was particularily interesting. It rained in the morning so when the cicadas came out, their shells weren't hardening enough for them to break free and they were just building up on the trees. When there was a bit of sunshine, they all started coming out at once. The molting process takes about an hour. It will be another hour or more before they have hardened and darkened. Although they are sometimes called locusts, they are not related to them at all. they are in the family Cicadidae and genus Magicicada. I hope you enjoy these cicada pictures.